The Oscars’ current dose of Anglophilia can likely be traced back to success of Chariots of Fire and the posture of celebrating English (British) Heritage, but with a twist. The ingredients of Empire may be reclaimed just so long as there’s a fleeting acknowledgment of past lapses. Sumptuous period trappings present older, better eras to hearken back to, but with a twinge of implicit criticism that the mores and values of the day may not have been all that snazzy. Conscience is relived sufficiently to permit the viewer a good wallow in past hues while tutting sagely at the less acceptable side. Since then, there has been a dance between the more formal rigours of the Merchant Ivory/Laura Ashley school of British cinema and the broader church of contemporary lovable working class comedy-dramas. 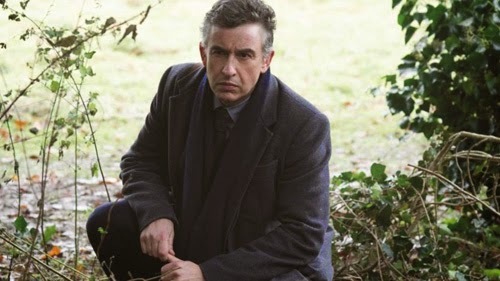 Philomena falls into the latter canmp, as Oscar Winner Dame Judi Dench’s unaffected OAP is chaperoned by Steve Coogan’s Oxbridge journalist in a quest to find the son who was taken from her many decades before by “evil nuns”. As Coogan’s Martin Sixsmith reluctantly observes, this is a human interest story; its dynamics allow writers Coogan and Jeff Pope to tackle the cynicism behind its telling in a meta-sense; when events don’t pan out in the expected manner we can be moved in a “wholly” genuine way, in the knowledge that the façade as been scraped away to reveal something good within. This isn’t your typical British Oscar bait, except in the sense that it’s typically atypical; it’s the film the ceremony loves to “discover” and give attention far exceeding its modest value. 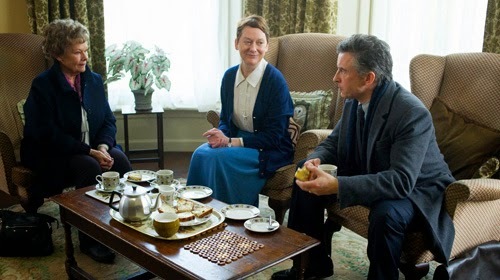 Philomena is a nice little story, crucially a “True Story”, well played by all concerned and with an all-important burst of fire in its belly (railing against injustice; the Academy loves that). The key to its success is its unfiltered niceness, wherein a near-octogenarian uses rude words and rotting pillars of the on-the-way-out establishment receive a much-deserved broadside. Its completely unremarkable nature is no doubt precisely why the Academy saw fit to remark upon it. Perhaps they should have been put off by the charge that the only people who appreciate this kind of story are “weak-minded, vulnerable, ignorant people” (probably at least two of those charges could be levelled at its members), but since Philomena has shown the savvy of raising that charge it believes it gets a free pass through self-awareness. For a while there in the ‘90s, it appeared almost as if any British movie could pick up credibility from the awards-givers. The gently provocative pictures of Stephen Frears, the director of Philomena, made his reputation with during the ‘80s (My Beautiful Laundrette, Prick up your Ears, Sammy and Rosie Get Laid) were more prone to BAFTA than Oscar attention (though Laundrette received a screenplay nomination). His first brush with the period piece managed to retain this earlier edge, with a showering of nominations for Dangerous Liaisons (including coveted Best Picture). He retained that bite with The Grifters, a coal-hearted Donald Westlake adaptation, but things turned patchy for him subsequently. Ironically, this was just as Merchant Ivory had peaked (the run of A Room with a View, Howard’s End and The Remains of the Day) and various Brit directors and projects were being feted for a range of conversation-worthy subjects; the must-see twist (The Crying Game), salt-of-the-earth steel workers turn male strippers (The Full Monty) and frightfully funny stammering toff Hugh Grant (Four Weddings and a Funeral). Even Mike Leigh was receiving sporadic veneration for his faux-working class tales of how “real” people live (Secrets & Lies). Meanwhile Frears had fallen into the Hollywood trap of botched or uncertain prestige projects; Accidental Hero, Mary Reilly, The Hi-Lo Country. He salvaged some credibility with a couple of back-to-basics Roddy Doyle adaptations, but the ‘90s wasn’t his greatest decade as a filmmaker. Since then his path has been a bit of a mess; there’s at least the comfort that he hasn’t one doesn’t quite know what he’ll settle on next. On the downside, he rarely settles on material with great potential. The last time he made anything really impressive was more than a decade ago (High Fidelity, Dirty Pretty Things). He has settled into the kind of amiable, amenable fare that often features Oscar Winners or nominees (see Dame Judi Dench, see Helen Mirren). Something for a mature audience, with the makings of a mild frisson (Mrs Henderson Presents), or a biopic of that reptilian monarch (The Queen). This lack of daring has brought him two Best Picture nominations (The Queen, Philomena), and there’s no longer any sense that his pictures are worth investigating on his name alone. It says something that a particular as self-consciously lightweight as Tamara Drewe might be his most interesting picture of late. I don’t expect his Lance Armstrong biopic will be revelatory. Philomena is almost wholly anonymous, not that stylistic devices ever announced his pictures; it was more that you could (once) see a running sensibility. Frears is now in the same passive mode as his last Dench collaboration here. Philomena is at least unassuming. In that sense, like An Education, it doesn’t demand attention. The problem is that when it gets a lot of it, it rather detracts from its unlofty merits. Prestige historicals have reached the stage where we can be shameless manipulated by the disingenuous triumph against adversity theme that can make royalty just like us really (The King’s Speech); if a king can feature in an underdog story, there are few limits to what will work (I guess it works for presidents, so give it a spin). Oscar winning actress Dame Judi Dench’s presence might cynically be seen as keeping an eye on the awards ceremonies just by having her there. But that isn’t so much her fault as that of an industry believing her mere evacuates nuggets of pure gold on a property (Bond). This time she plays Philomena Lee, a woman who was sent to an Irish abbey in the early 1950s after getting pregnant. Philomena had to work in the laundry to pay her keep, allowed to see her child for an hour a day. Until that is, he is given up for adoption. Philomena didn’t see him again, and kept his existence a secret from her family for 50 years. This role gives Dench extra credit, since the ceremonies are so used to her playing starchy posh bints; here she is down-to-earth, super-polite and full of humility. Philomena likes her romance novels, The Daily Mail and Reader’s Digest (as Sixsmith witheringly summarises). 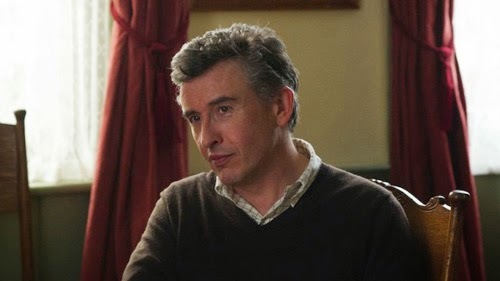 Instead it’s Coogan’s Martin Sixsmith who is a bit of a stuck-up prick, and the actor is ready and willing to show the character’s less flattering side. After all, Sixsmith, for all his lack of people skills, has righteous anger on his side. 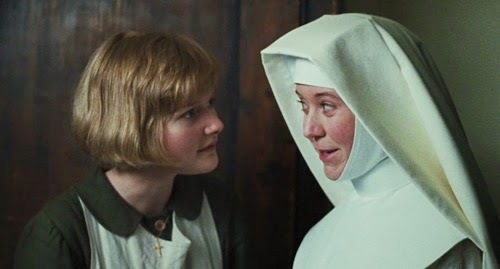 As undercooked as the picture’s fury is (it’s much too nice to really get het up), he represents the audience surrogate in responding to the behaviour of the nuns; stoical Philomena may take the high path, but we don’t necessarily think that’s the correct one. 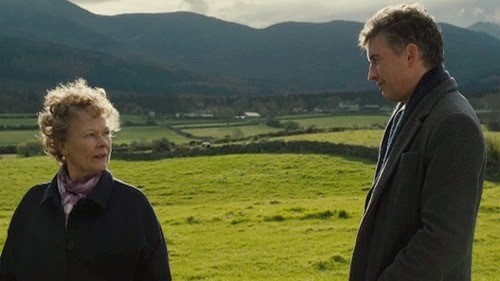 In Coogan and Pope’s favour, they don’t succumb to a forced “they become best of friends” relationship between Sixsmith and Philomena. Even if there’s a conciliatory final scene, even at the end she avows her difference to him (“But I don’t want to hate people. I don’t want to be like you”). Whether or not we should come down on the side of her attitude or Sixsmith’s articulate fury (“Well, I couldn’t forgive you” he informs vile Sister McNulty) is a debate the film is content not to have; it provides a catharsis in the sister’s presence that didn’t exist in real life (she had died by the time Sixsmith investigate the story) so the priorities are fairly clear. Sixsmith, who started out as a BBC journalist is, of course, is best known for the controversy that ended his flirtation with New Labour and allegations of attempting to manipulate the media by burying unpopular stories in the wake of 9/11. He went on to indulge his passion for Russian history (lightly mocked here) and offer his services to Armando Iannucci on The Thick of It. Given that he reportedly liked Coogan’s portrayal, and its not the most endearing of portraits, one has to wonder. But Philomena’s unadorned wisdom (“You should be nice to people on the way up as you might meet them again on the way down. Now you of all people should know that”) is rarely less than manufactured, and the picture is unwilling to actually frame Sixsmith down as a full-on manipulator (when he is asked to keep Philomena in the US to find the story, or says he won’t publish, she helpfully provides him with the answer he wants to hear on each occasion). The trail of deception laid by the sisters of Roscrea to prevent Philomena from reuniting with her son is compelling. The point where the story appears to end actually leads to its most blistering twist; as Sixsmith pointedly asks “It’s not very Christian, is it?” If Philomena provides the acceptance, we side with Sixsmith when he asks, “So what are you going to do? Nothing?” Her dismissal that being as angry as he is must be exhausting doesn’t quite cut it, as someone needs to be. Less well-judged perhaps are Sixsmith’s attacks on belief, mainly because they are so standard issue; he’s better when he sticks to the Church itself, as it’s the institution and its cruelty and avarice that are at the root of the story (“The Catholic Church should go to confession, not you”) We want him to go further, but that’s no doubt why The Magdalene Sisters didn’t receive a brace of Oscar nominations. The humour of the picture always seems a little broad, from running gags over Philomena’s lack of airs and graces and culture shock (hotel bath robes, Bucks Fizzes, rambling anecdotes, simple openness to others, her lack of surprise on learning her son as a “gay homosexual”) to Sixsmith’s not-actually working for News at Ten. At times you can hear Coogan the comedian too loudly in the writing, although this is never evident in his performance. He is sure and accomplished opposite Oscar-winning powerhouse Dame Judi Dench. Frears’ work is unobtrusive for the most part, although the “in her mind” flashbacks to times past through home movie footage is superfluous and crude. Coogan seems to be on a bit of a roll at the moment, with choices that emphasise his versatility. He’s making a fist of it on the big screen such that memories of ill-advised transatlantic jaunts (Around the World in 80 Days) are banished. 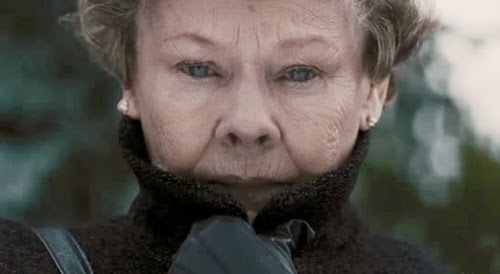 Dench carries so much prestige now, it can be an albatross around the neck of a perfectly likeable little movie. She’s good, she always is, but that’s the point; you know exactly what you’re getting with her. This is the least of the 2013 Best Picture nominees, which on one level is an indication that there were no stinkers amongst the crop, but it also illustrates that everyone concerned with Philomena had their sights set low; it only wants to be just-a-little thought provoking, just-a-little humorous, just-a-little dramatic. It just wants to be nice.